My family and I were passing by EDSA last November when we saw this one. I grabbed my camera and took this photo. This was in the Gate 5, Greenhills area of EDSA in Metro Manila, approaching Ortigas. The driver was fast! And back riding seems normal for the dog. There were no "seatbelts" or anything for the dog. Just pure balancing act. 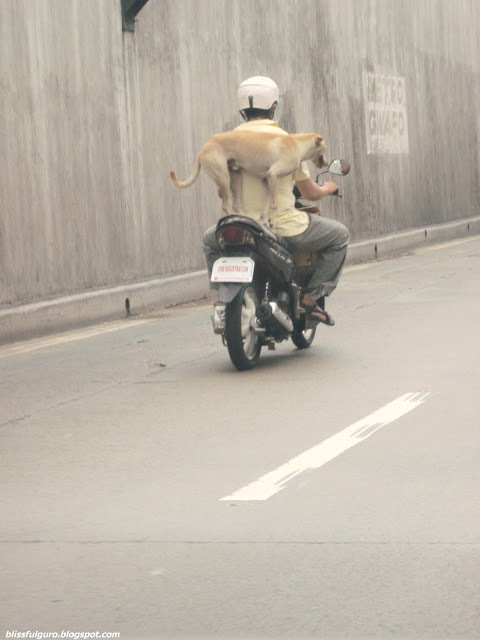 I dunno if I should be proud of the dog for maintaining perfect balance, or be mad at the driver for sacrificing the life of a dog, but this is quite strange and cute noh? Truly, only in the Philippines!